Geography is concerned with the interactions among humans, their social contexts, and the natural environment. The discipline includes topics, techniques, and perspectives from the humanities and social sciences (“Human Geography”) and from the physical sciences (“Physical Geography”). Our department also offers classes in techniques and methods such as Geographic Information Systems, Remote Sensing, Spatial Analysis, and Field Studies (“Techniques”). Geography is housed in the Faculty of Science, but offers programs in Arts (BA), Science (BSc), and the Interfaculty option (BASc). See this link for a complete list of our course offerings. In Life After McGill, our graduates go on to many different careers and many kinds of advanced study. A major in our department can give you the world! Contact Michelle Maillet, our Undergraduate Advisor, at advisor.geog [at] mcgill.ca for more information on our majors, minors, and Honours program. Her regular advising drop-in hours are Mondays from 1pm to 3pm, Wednesdays and Fridays from 1pm to 4pm, as well as Thursdays from 2pm to 4pm. She is located in Burnside Hall room 323. For more information on the role of the advisor, and on additional resources in the University, please see the Geography_Undergraduate_Advising_Guide. 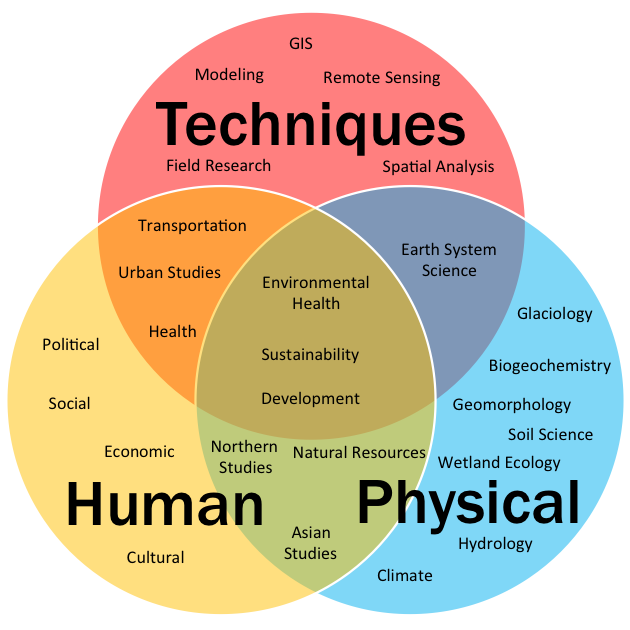 Although the discipline is conventionally divided into Human Geography, Physical Geography, and Techniques, work in Geography often overlaps one or more of these areas. Students in any degree program (BA, BSc, or BASc) can take classes in all areas and in all overlaps. Are you concerned about the human dimensions of climate change? Cyclists’ rights to city streets? Rural livelihoods in the Global South? Globalisation and its impacts on poverty, development, and inequality? The sustainability of natural resources and economic growth? The effect of the environment on human health? How communities use their local environments? The political representation of minority and marginalized groups? Do you wonder why Montreal, Kuala Lumpur, and Mumbai look different from each other? Or why they are similar? Why Saudi Arabia is building new cities? Why urban areas have such diverse populations? Why cities have both the extremely wealthy and the very poor? Are you curious about the landforms and landscapes that make up the Earth's surface? How hydoelectric power sometimes contributes to global warming? How bogs and salt marshes might help control it? The impact of global warming on Arctic environments? The extent and effects of deforestation? Changing patterns of agricultural and urban land use? The effects and consequences of dams? The global supply of fresh, unpolluted water? Then one of the Department of Geography’s programs could be the right place for you. The McGill Undergraduate Geography Society (MUGS) is active in a range of academic and social activities, including the annual publication of Fieldnotes, a journal of undergraduate research. All major, minor, and honours students in Geography or Urban Systems are members. See the MUGS Facebook and MUGS Instagram pages for more information and fun things. MUGS 2/12: LEED Certification, Valedictorian Applications, Social Justice, etc.